The holidays bring many celebrations, some of which are little bundles of joy that families must prepare for in the new year. 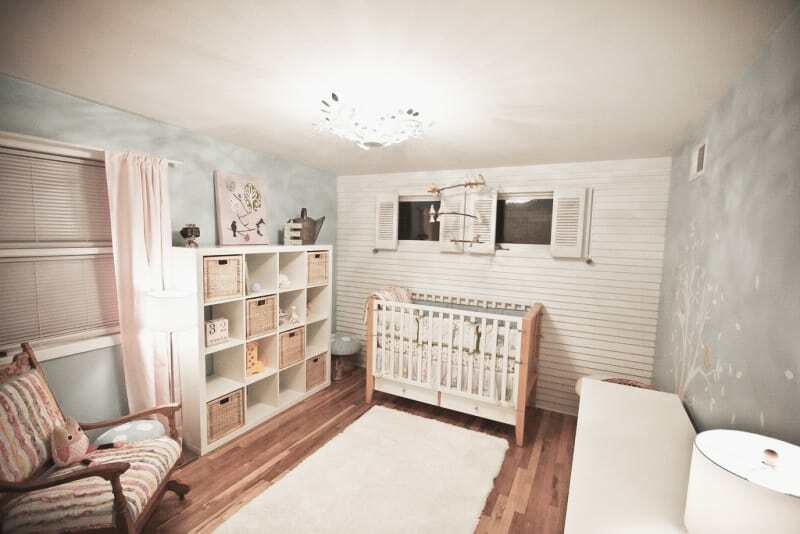 Home remodeling for a nursery is an exciting experience that will be forever treasured! We have listed some ideas to get you started when it’s time to convert that extra room into a nursery! General contractors will concur that circulating oxygen in a nursery is of highest importance, as statistics show that not only does it improve an infant’s sleep, but can reduce the risk of Sudden Infant Death Syndrome (SIDS) significantly. Parents should not be worried that their baby will be chilled by a fan, as doctors have validated that only if a baby is perspiring would they feel a chill from a fan. Fans do not actually cool the air, but simply move air around. Installing a ceiling fan with a remote would be ideal for when you’re busy feeding, changing, or spending precious moments with your baby. -When choosing a room for your nursery, a room that has a window is most favored for natural lighting. If the room doesn’t have a window, you may consider asking your Las Vegas contractor to install one. Providing your new little member of the family with plenty of natural light has many positive benefits. Natural light increases human proficiency and helps regulate circadian rhythms–basically a 24-hour internal clock that is running in the background of your brain and cycles between sleepiness and alertness. Regulating sleep patterns is significantly important for babies, as it allows them adjust to a normal 24-hour day. Streaming natural light into your nursery also helps stimulate vitamin D production. Make sure the baby’s crib is not directly by the window since excessive sunlight exposure could be damaging your child’s skin. Install blinds, curtains or drapes for baby’s nap times. -Ambient lighting is important to your nursery as it provides overall lighting for the room. Ask your contractor in Las Vegas to help you choose warm colors for your nursery lighting in order to create a relaxed, peaceful environment for your baby. -Incorporating a dimmer switch will allow for a more tranquil atmosphere. This is especially helpful at times when your baby is restless. A dimmer with a remote is also ideal, as it is very convenient while tasking in the nursery. -Nightlights are ideal for adding just enough light to help a newborn adjust to their environment, as well as helping guide a path to check on your baby at night. Nightlights provide adequate illumination in your nursery for feedings and changing your baby, reducing over-stimulation so your baby will become more familiar with healthy sleep patterns. -Colored lights can also add to creating a tranquil environment for your baby. Blue lights create a calming effect, while amber lights give off a soothing glow similar to candlelight. Since your child’s eyes are still developing, layering your nursery with natural light, ambient, task, and accent lighting will help maintain a healthy balance for your baby’s environment. It is not always possible to have a bathroom connected to the nursery; however, if you do have this layout already or are able to hire a general contractor that can help you with your bathroom remodeling, this would not only be a tremendous help to have next to the nursery–but having the bedroom with attached bath will benefit your child throughout the years creating privacy, independence and responsibility—not to mention adding value to your home. Your baby may be small, but plan ahead for the future with a full bath/shower, vanity and linen closet for extra storage of sheets and towels. With running water just steps away, it makes life a lot easier. It is also beneficial to have a water softener installed to protect your baby’s delicate skin. You may want to opt for your bathroom countertop to have the sink at one end so that you have more counter space to place a changing pad on should you need to change your baby in the bathroom. A baby’s nursery will soon turn into a toddler’s room that will require not only organization, but a place to create, dream and explore. Shelving in the nursery is ideal for storing baby supplies, stuffed animals, baskets for bibs, blankets, socks & shoes etc. However as your baby grows, shelving is also wonderful for displaying books, as well as adding baskets for art supplies, toys, games etc. Renovating your room to incorporate custom built-in shelving is a good way to maximize space and make the room more attractive and unique. Your baby’s room should be uncluttered and organized so that you can always maximize quality time with your child. If the extra room has a basic closet, you can have your Las Vegas contractor discuss home renovation ideas for installing smart storage units inside the closet to get your baby’s items organized. Before baby arrives, it’s best to have the walls washed, free of dirt and dust. If you decide on repainting after cleaning the walls, choose a paint free of VOCs to minimize the presence of chemicals in your nursery. Your general contractor LV will help you choose the correct paint for your nursery. When it comes to choosing the right colors for a baby’s room, you may want to study a bit of color theory. When it comes to home remodeling to prepare for a nursery, there are many things to consider and many choices to make. Consult with your general construction company to guide you through every step to ensure your baby’s new environment is a healthy, safe and happy one!